Last week, Blizzard launched a spiffy new website. The improvements run a little deeper than just a cosmetic touch-up, however: they've for the first time begun offering digital downloads of their games from their own online store. 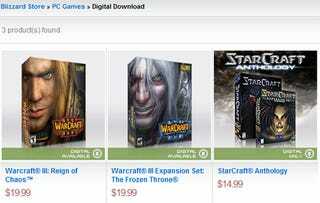 Warcraft III ($20), Frozen Throne ($20) and the Starcraft Anthology ($15) are all available, with more (including Diablo) promised to appear later down the line.